Will adding seat covers hamper the functioning of the air bags especially since the lower variants have cloth type material and not leather seats which are there only on the top end? This reminds me if the time when Aria was launched it was priced higher than Innova for some variants at a time Innova was the market leader. The Aria failed badly. Toyota has done same with the Yaris the only advantages being, better saftey and Toyota reliability but not sure if this will be sufficient for the premium charged. I absolutely loathe the design language Toyota has chosen for the Yaris. It's very mediocre and just so blah inside out. To call the Yaris a formidable competitor to the Verna and the City that are far ahead in the game at least in the design department, just says Toyota continues to take us for granted when it comes to pricing. I understand the reliability factor that once was with earlier Toyotas but I believe we all agree that this very reliability is just not the same with their latest offerings. The Yaris at these prices, if it doesn't flop which it just might not, only we are to blame. Last edited by 9thsphinx : 21st June 2018 at 17:14. 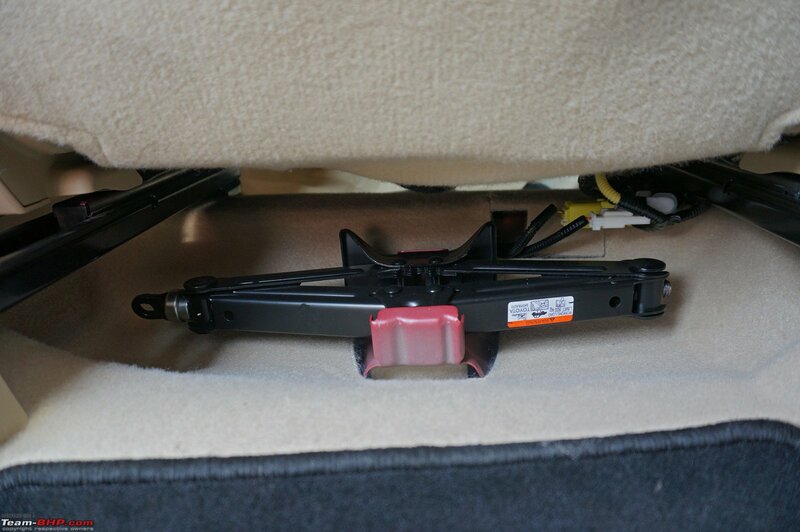 Even if you can move it the passenger seat back, you're going to start shifting stuff around in the rear. It's even worse when you have to put it back in its place! All that dirt or even worse mud, from the road is going to soil the cream carpet. And if it's not tightened properly, its going to start rattling. Excellent review! Read it all in one go. While you have mentioned that the manual does 100 kph at 2500 RPM and 120 at 3000 RPM, but what about the CVT? What are the RPM figures for the CVT at these speeds? Last edited by hiren.mistry : 21st June 2018 at 18:07. Brazil, Thailand and India are not similar economies at all. They are all developing countries but the other two are far ahead of India. Per capita GDP/ income in India is just $ 1800 (one of the lowest in the world) while Brazil is at around $10,000, over 5 times higher than India. Thailand has a figure of $6,000, 3 times higher than India. A simple look at Rio or Bangkok will show you the clear difference. Their level of car ownership is much higher as well. It would take India about 15 to 20 years to reach Thailand's current levels if a high growth rate continues and the Rupee doesn't fall to much. It would take even longer, over 20 years, to reach the current level of Brazil. Even China hasn't reached there yet. Therefore, their markets are much more advanced than us even though they are behind when compared to fully developed nations. You can see the difference in feature availability and customer preference in India in the past 20 years and imagine the scenario over the next 2 decades. Boot lamp is just an open bulb with a small grille. Looks cheap in such an expensive car. That's lifted from 9th Gen Corolla (2002-2007). I'm looking for the snaps from my car, couldn't locate though. What is that cover like thing (circular), surrounding the rear disk? Looks like some sort of housing or something, for the disk. Last edited by Mr.Boss : 21st June 2018 at 19:22. The lackluster, after-marketish HU, the dull engine, the frankly overdone styling, the mess that is the arm-rest, strange seating position for the rear-middle passenger, puny wheels, the placement of the jack, and on top of everything - the PREMIUM pricing. I think the Yaris is a good car with no major drawbacks. Unlike the MPVs, Toyota should realize that the City, Ciaz and Verna are formidable competition- not ignoring the twins from VAG either. I'll not be surprised to see discounts a few months later- the car would have been a tempting buy if it wasn't crazy expensive compared to the City. Most of the said flaws of the Yaris in my humble opinion are superficial. The Yaris is like the faithful and dependable spouse on whom you can lean on, the one you take home to your parents. The Yaris best features seem to be the ones which are invisible to the eyes, the build quality, the safety, the handing, reliability, the braking, the cocooned comfort of the glasshouse etc. For more bling look elsewhere. I believe there is more to this car than meets the eye. As per me the only gripe is that it's overpriced way too much. 14 lacs on road and you have to settle for cloth fabric seats instead of leather is what will make me think twice before putting my money on this car. Had a go in the Yaris yesterday, it was the top end VX CVT. In comparison to my New Gen Verna Diesel SX(O), the interior design felt very old and in your face in comparison to the Verna's more flat and modern layout. The quality though, of the materials and as such of the interior itself felt half a notch above the Verna's. The engine was refined with a light foot with absolutely brilliant NVH and barely any road or tire noise. AC worked well in the 48 degree heat of Gurgaon. However, all the positive impressions about the silent and refined engine vanished as soon as I put my foot down. The engine felt very loud( not in a sporty enthusiastic way) and laboured above 3000 RPM with barely any momentum gained for around 2.5/3 seconds. It is definitely not a car to be driven spiritedly. The road manners though, deserve a special mention. Coming from an all German garage consisting of a BMW X3 and a Skoda Rapid, the Verna was a huge disappointment in the way it drove. Unsettled ride in comparison to rapid and the light steering didn't help things either. The Yaris pleasantly surprised me with its firm and un-japanese like suspension, and felt much more solid than my Verna at highway speeds and just a notch below my Rapid. The brakes too were extremely responsive and barely had any fade even after repeated hard braking. With these kind of dynamics, the Yaris surely could've done with a better engine. Another bummer is the lack of headroom in the second row. I'm 6.0 feet tall and with my extremely laid back position, legroom wasn't that great either. The pricing doesn't help either so I don't seem to understand what the target audience is. Adequate safety features are provided in all the cars of this class, the Hyundais are fairly reliable, driving enthusiasts have the VAG twins and the City, good Diesel engines are provided by the Verna and VAG twins again ( i know the Yaris does not come with a diesel, another negative), automatic petrols come in the form of Verna, city, vento, rapid with vento being the most fun to drive and Verna auto providing a nice smooth experience along with the rapid and city being closeby. So I don't understand this strategy by Toyota. They should understand, they aren't well established in this segment and do not have well known names like the Innova Crysta and the Fortuner. Sad story, as the product itself okay and had the potential to sell had it been priced lower, as a facelift of the Etios rather than a whole new car in a new segment. If yaris is a newly created model, I'd have accepted all those negatives, hoping that it will be corrected in the next gen. For example 1st gen amaze had some issues, but most of them are rectified now and recollect 3rd gen city's improvement over 1st gen. Even 'introductory' price is on higher side, imagine what would be the regular price? To take on a 20 year old champion you gotta be clever and strong. I agree city's build is not as sturdy as Yaris , but the engine, space, looks? If we were in 80s, reliability would've been a crucial factor. Now, almost all manufacturers produce reliable cars at least in the passenger vehicle category. So no point banking on just a single factor. In fact I love Toyotas, that's why wanted to own this, but unfortunately I had to pay 13 lakhs for the variant I chose and still compromise a lot, so removed Yaris reluctantly from my list. In my opinion, Yaris is analogous to a 9-5 job, It gives everything you want but nothing exciting. Great review as always with great attention to detail. However, this is one ugly looking vehicle , seems like a modified Nissan sunny to me. Seriously Toyota can do better and i don't think the taste of an Indian buyer is this bad that we have to buy such ugly car for a big sticker price. It may be having some segment first features but to me, if you don't look back at your car after parking and feel good about it, it is a big NO. The Verna as a competitor ticks all the boxes for me if i was to buy a sedan today with awesome looks and Gem of an engine. The one's which will be sold shall only be bought on the basis of the T badge and its snob value. Would i bother even having a test drive of this vehicle? well seriously no because i would not like myself to be seen driving such a car and that too when i have wonderful options in the same price band. Just my 2 cents, no offence to the one's who are planning to buy this thing. Agree, but 60K difference in ex-showroom makes a big difference in OTR price due to tax slab change, TCS, and insurance premium increase. A job almost well done – that’s what I feel about the Yaris. Toyota has done many good things with this model – starting with the full-on safety options, and even the ever-elusive 3-point seat belt for the rear middle passenger. On second thoughts they probably added that just to ensure that the middle passenger doesn’t get any unfortunate injuries by banging against that protruding centre armrest assembly. But happy that they finally woke up and decided to bring a car which at least look modern enough to be in its segment.